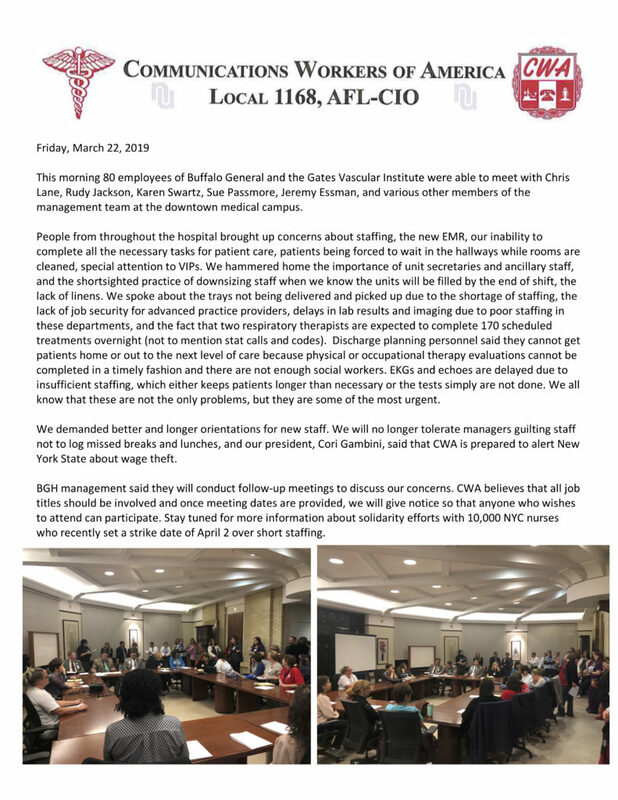 March 22nd Update – BGH Members Take on Staffing in Their Buildings! 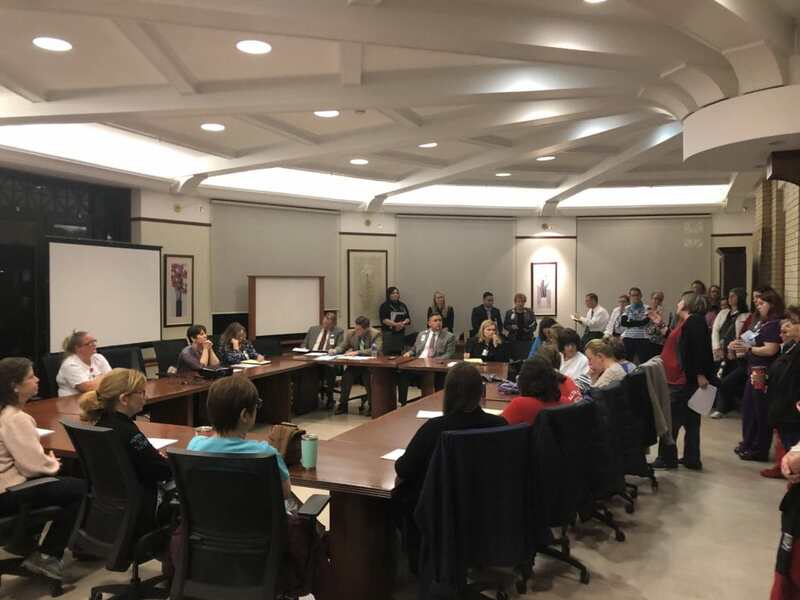 This morning 80 employees of Buffalo General and the Gates Vascular Institute were able to meet with Chris Lane, Rudy Jackson, Karen Swartz, Sue Passmore, Jeremy Essman, and various other members of the management team at the downtown medical campus. 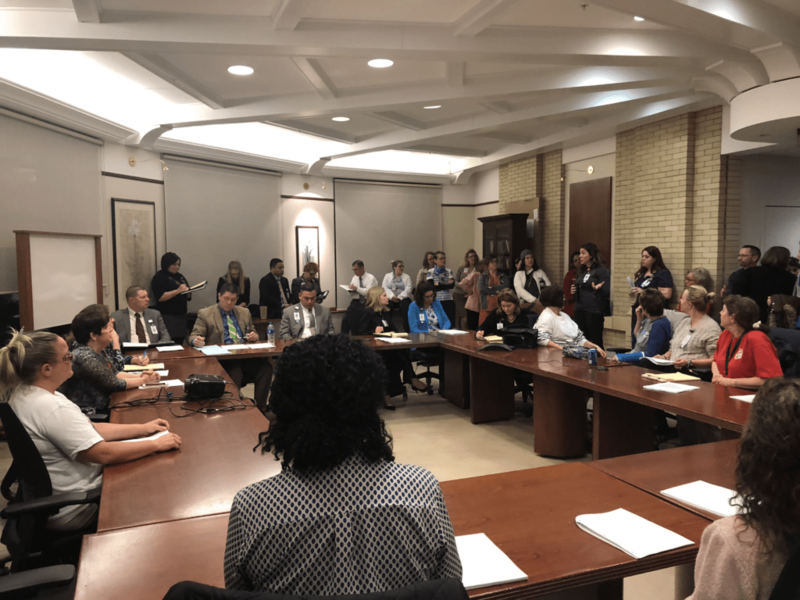 People from throughout the hospital brought up concerns about staffing, the new EMR, our inability to complete all the necessary tasks for patient care, patients being forced to wait in the hallways while rooms are cleaned, special attention to VIPs. We hammered home the importance of unit secretaries and ancillary staff, and the shortsighted practice of downsizing staff when we know the units will be filled by the end of shift, the lack of linens. We spoke about the trays not being delivered and picked up due to the shortage of staffing, the lack of job security for advanced practice providers, delays in lab results and imaging due to poor staffing in these departments, and the fact that two respiratory therapists are expected to complete 170 scheduled treatments overnight (not to mention stat calls and codes). Discharge planning personnel said they cannot get patients home or out to the next level of care because physical or occupational therapy evaluations cannot be completed in a timely fashion and there are not enough social workers. EKGs and echoes are delayed due to insufficient staffing, which either keeps patients longer than necessary or the tests simply are not done. We all know that these are not the only problems, but they are some of the most urgent. We demanded better and longer orientations for new staff. 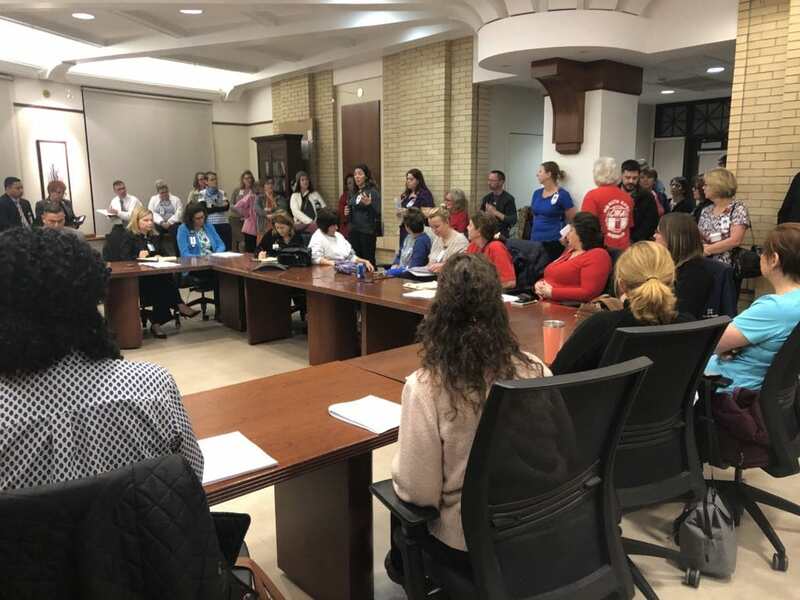 We will no longer tolerate managers guilting staff not to log missed breaks and lunches, and our president, Cori Gambini, said that CWA is prepared to alert New York State about wage theft.